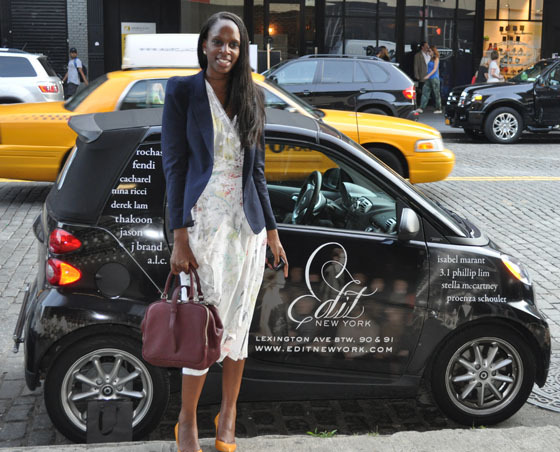 During NYFW 2011 one of my favorite bloggers Catherine Kallon of Red Carpet Fashion Awards wore an Alexander Wang Printed Wrap Dress CIRCA Spring 2011. We don't get the pleasure of seeing many pics of Catherine but I would say her style is classic and feminine. Loves it! Preetma Singh a Vogue Fashion Assistant was also roaming the streets showin off her legs during NYFW 2011. Preetma choose to top off her shorts with an Alexander Wang Printed Silk Trench Coat CIRCA Spring 2011.